Cornerback Patrick Peterson, special-teams standout Justin Bethel and outside linebacker John Abraham will represent the Cardinals in the Pro Bowl. One is an every-timer, one is a first-timer and one is an old-timer. No matter. 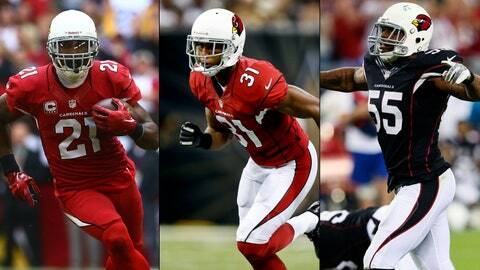 All three Cardinals will be making the trip to Hawaii for the Pro Bowl on Jan. 26. The NFL announced the Pro Bowl roster on Friday — the teams will be chosen in a schoolyard-type draft on the NFL Network on Jan. 22 — and cornerback Patrick Peterson, special teamer Justin Bethel and John Abraham all made the cut. Receiver Larry Fitzgerald, defensive end Calais Campbell, defensive tackle Darnell Dockett and linebacker Daryl Washington were named alternates despite the fact that Washington missed the first four games of the season due to a suspension. Any of the four could wind up in Hawaii if players ahead of them get injured or play in the Super Bowl. The notable snub? Linebacker Karlos Dansby was left off the roster and has yet to make the Pro Bowl in his 10-year career. Dansby is third in the NFL in solo tackles (109), has four interceptions (two pick-sixes), a forced fumble, a fumble recovery and 6.5 sacks and was voted team MVP by local members of the Professional Football Writers of America this season. Dansby said earlier this week that it would mean something if he made it for the first time coming off what he called his best season as a pro, but he insisted he wouldn’t be hurt or surprised if he didn’t make it. When reached by text Friday, Dansby took the high road and texted: "DPOY!" (defensive player of the year), noting that "it would be crazy" to win that award and not make the Pro Bowl. Peterson is only the second Cardinals player since Ollie Matson to make the Pro Bowl in each of his first three seasons. His selection wasn’t a surprise since he finished in the top three in fan voting and has become a lockdown corner for the Cardinals. He has three interceptions, 28 passes defended and 38 tackles this season. Bethel has 18 special-teams tackles and two blocked field goals and has made a name for himself among Cardinals fans for his ability to get downfield on kick coverage, helping force opponents to start 53 drives inside their own 20-yard line, which ranks second in the NFL to the Chiefs’ 54. Abraham actually considered retiring before he signed a two-year deal with the Cardinals as training camp began. He wasn’t even a starter when the season began, but season-ending injuries to starting outside linebackers Sam Acho and Lorenzo Alexander led to his insertion. Abraham is fifth in the NFL with 11.5 sacks, the most ever by a Cardinals linebacker. He also has 50 tackles, four forced fumbles, four tackles for loss and 26 quarterback pressures. This is his fifth Pro Bowl selection, and he has earned them with three different teams (Jets, Falcons). His 133.5 career sacks are the ninth mostl in NFL history.